Burleson Oracle Training has on-site Oracle Database 12c new features training by Oracle 12c experts. We have complete Oracle 12c DBA courses and Oracle database 12c DBA training classes. BC can design a Oracle 12c training course to meet your training goals. 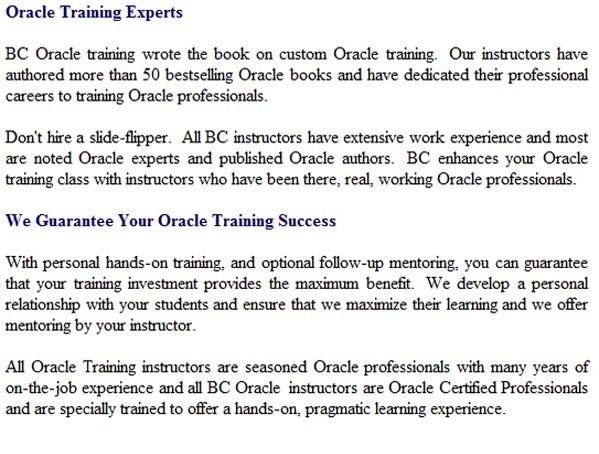 BC utilizes only senior level Oracle certified professionals to conduct our Oracle 12c training courses. Call now to set up your Oracle 12c training course. Burleson specializes in Oracle 12c new features training for Oracle Database 12c, and offers expect classes in Oracle 12c new features training and Oracle 12c DBA training courses. Call now to set up your Oracle 12c training course.